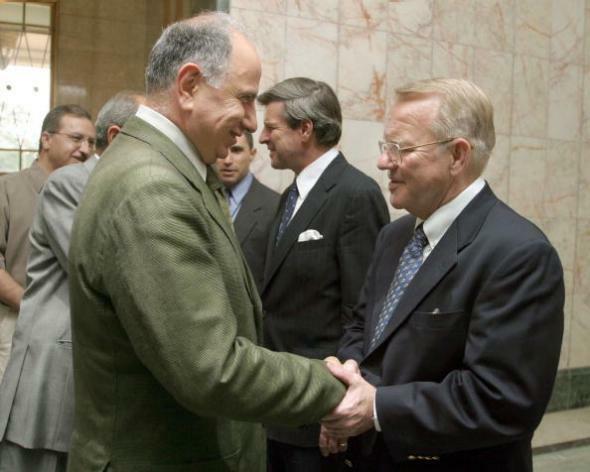 Ahmed Chalabi dies: Had advocated Iraq war over WMDs. Ahmed Chalabi with U.S. officials Jay Garner (right) and Paul Bremer (center) in Baghdad on May 16, 2003. Ahmed Chalabi—the Iraqi exile whose Iraqi National Congress opposition group was funded by the United States for years, and who helped spread later-discredited claims about Saddam Hussein’s purported weapons of mass destruction programs that were a major reason many Americans backed the second Iraq war—has reportedly died in Baghdad of a heart attack at age 71. As it became clear that Iraq did not have an active chemical, biological or nuclear weapons program and as the occupying American forces did not receive the welcome that the Iraqi opposition had predicted, the Bush administration distanced itself from him.